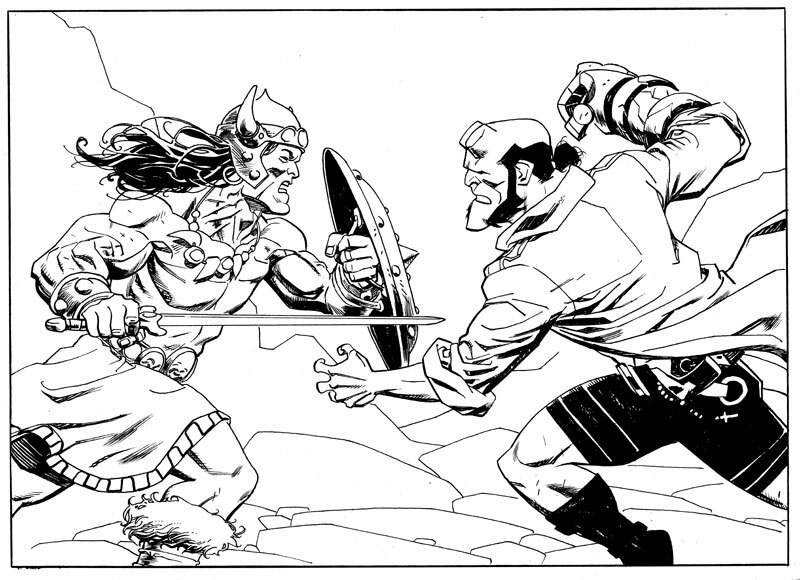 Mike Hawthorne: Conan VS Hellboy! The crossover you never expected! Still can't believe we're doing it! Ok, ok. This was a bit of a put on for April Fool's Day! Well, you can only blame yourselves! I never ACTUALLY said it would be a comic crossover, just a crossover in this piece of commission art! To make it up to you guys, the first ten people to e-mail me at mhawthorne @ thinktankcomics.com gets a free Conan sketchcard! Got all ten people lined up for free sketches. Thanks everyone, and sorry if you missed out this time around. Love it! Hey, remember those awesome What if?.. issues where Conan came to modern day New York? But this is an April Fool, surely? I mean I hope it isn't! Stop dat right now, eye-melt!!! This would be the wrongest (non-debilitating) April Fool’s joke ever. This would be great and make sense. Those two could throw back some massive amounts of ale. Their bar tab would be out of this world. I love you, Mike Hawthorne. Freakin' awesome! But this is just one your commissions, right? OMG! I gotta have it! Finally an official CONAN crossover! Very very cool ghoul very cool! John G. - Right back at you, man! It is April 1st after all! Thanks for playing along everyone! Sorry if I misled anyone and got your hopes up. "CROM the Ultimate Conan fan blog"
HA! Thanks for being a good sport, and for the link!